Call Center Scorecards, Balanced Scorecard or simply scorecard exist to enable call center managers to review overall call center performance. The scorecards also assist top management in their quest to understand the value and performance of the call center. Too often top management views the call center as a cost center and does not understand the value that the call center brings to the organization. In addition, when a call center manager has to explain how well the call center is performing numerous statistics, charts, graphs and reports are provided which end up confusing top managers. A balanced scorecard provides a single easy to read and understand Excel file that focuses on a few key performance indicators rather than 100’s of statistics. Furthermore these KPI’s are weighted and compared against either the company goals or industry benchmarks. Each industry has its own set of KPI’s that should be used to create a scorecard. However, just using the industry standards may not be enough for your business. Each call center needs to review their needs and adjust the scorecard so that it is most effective for the business. 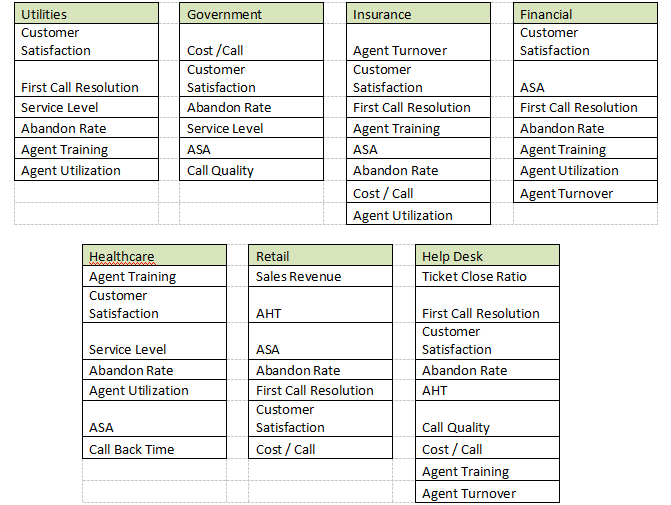 Below is a list of KPI’s that call centers have used to create a scorecard. An agent’s desktop scorecard can look and have a different set of data compared to a manager or supervisors scorecard. Showing the days goals followed by the target and the threshold conditions can change an agent’s performance. Industry Scorecard KPI’s will differ by industry. What one industry would focus on is not the same as what another industry might focus on. Here are some examples of KPI’s by Industry. Your contact center may want to focus on some different KPI’s, but this can be used as a start. Within each call center these scorecard KPI’s could change. For example, an insurance based call center that has a group that takes calls for policy cancellation calls and another group that handles new policies may not have the same goals on abandon rate and ASA. The KPI goal and benchmark may differ for each group and it would be inappropriate to use the same for each group. The Call Center Manager needs to review what is important to each business unit and what will affect performance when deciding on which KPI’s to score. Using 3 to 8 KPI’s is ideal for the balanced scorecard. Fewer than 3 KPI’s and any change to a single KPI changes the overall scorecard value quickly. A significant change to a KPI is not seen in the total score when there are more than 8 KPI’s are evaluated. The weighted value of each KPI needs to be considered as well. Too much weight on a single KPI will affect the outcome of the scorecard quickly. Determining the weight to put on each KPI is up to the call center and its purpose. There are industry standards for each KPI but each call center is unique and these standards may not apply. In most cases Customer Satisfaction, First Call Resolution and Cost / Call are more heavily weighed than Service Level, ASA and Agent Training. 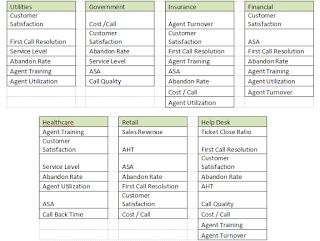 There are many types of scorecards for a contact center to consider and use. Team Scorecard: A scorecard for the skill group. Because skill groups have different goals it is not beneficial to use the same goals for each skill group. Summary Scorecard: An accumulation of team scorecards or agent scorecards. Weekly, Monthly, Yearly Summary report: This is a summary scorecard for each type of scorecard. 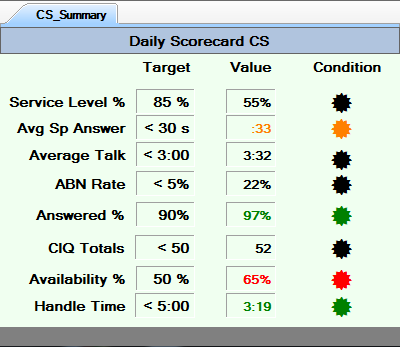 For example a weekly scorecard report for the Contact Center Scorecard. Contact Center Scorecard: A select group of metrics showing how the entire contact center is performing. Should the scorecard use company goals or industry benchmarks to determine the performance? Both are valid methods for determining performance. A company new to scorecarding may want to look at its own company goals first to become acquainted with using the scorecard. This “trial” period will also help determine if the KPI’s that are being used in the scorecard are appropriate. Once the company is comfortable with the scorecard looking to industry benchmarks can provide insight into where the company is in relation to the industry average. A properly built scorecard is a very effective tool for the call center manager. With a single report the manager is able to determine how well the contact center has functioned that day. By trending these reports a manager is able to show how performance is improving within the call center. The scorecard will also assist the manager in finding the areas where performance is weakest and needs the most improvement. For more information about Call Center Scorecards contact Spectrum or visit our website.